I’ve had enough of people calling cryptocurrencies scams. I understand that the crypto space has witnessed many scams but that doesn’t mean the whole industry should be labeled a scam. This shows the negligence on part of such people who refuse to spend some time learning about the latest revolution. And that is because such people have pre-conceived notions strongly etched in their minds. Like I stated earlier, there are scams, undeniably, but isn’t it true for every other industry in the world? 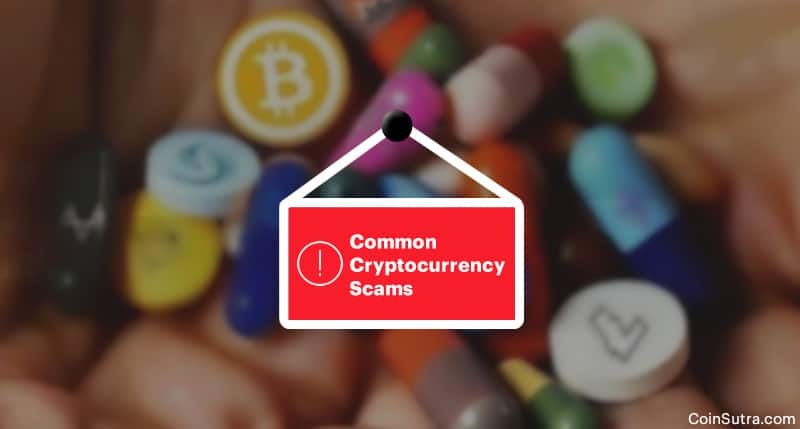 Moreover, I acknowledge that fact and that’s why I am here to tell you about some of the most common forms in which crypto scams take place. Instead, it is the ignorance of newbie investors who dream of 100x gains in a matter of weeks by just HODLing worthless ICO tokens. The second most common form of scam that you will come across would be a ‘shady exchange’. The exchanges that sprang up over-night and started bragging. One needs to be very careful with such exchanges because once you trust them and deposit your coins there, you have no way to get it back if the intentions of that exchange are not right. Also, some exchanges that start well can run away with your money any time because they fail to scale and innovate to stay relevant in the market. 01crypto, Btc-cap, Capital-coins, Coinquick, Cryptavenir, Crypto-banque, Crypto-infos, Cryptos.solutions, Cryptos-currency, Ether-invest, Eurocryptopro, Finance-mag, Gme-crypto, Gmtcrypto, Good-crypto, Mycrypto24, Nettocrypto, Patrimoinecrypto, and Ydconsultant. With the launch of Bitcoin, many fake android wallets have also been launched on play store. That’s why it is a big NO from us to pick any wallet randomly from the play store because there are chances that it will be fraudulent and you may end up losing your money. Though these wallets may promise you the seed and control of your funds, never fall for them without proper due-diligence. It is one of the easiest ways to scam people and happens many times during the launch of Bitcoin forks. These wallets take your seed or private keys and rip you off your BTC too. This form of scam is easiest to spot but people still fall for it. If you find a crypto project that actively encourages the recruitment of new investors to maximize your profits, it is a Ponzi scheme. This system works on the model of scamming the one who enters the system later. 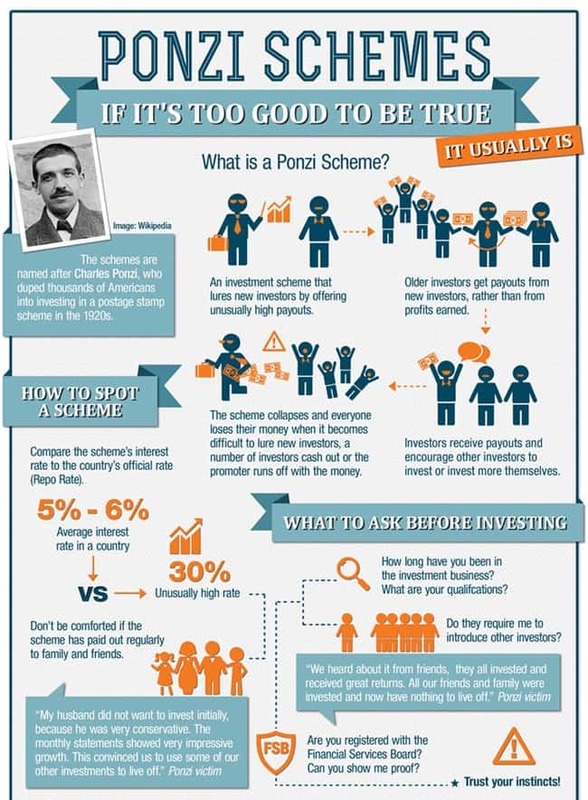 Also, schemes that promise absurd returns are definitely Ponzi schemes. You can quickly do a litmus test to avoid such schemes or projects by following two simple bits of advice given by Andreas M. Antonopoulos, a renowned Bitcoin speaker, and proponent. Phishing scams are another common form of scam in the cryptosphere. Pump & Dump groups on Telegram, Slack, and IRC are not something new in the traditional market also so why the crypto market will be left behind in this. If you search on Telegram, you will find many crypto groups with 40,000-100,000 members in it. What do you think they do in such groups? They don’t chit-chat. Instead, these groups are the tools to manipulate the prices of altcoins that have low market caps. In this way, people who act fast or first get the advantage and the people who are a bit late suffer from the plummeting prices in just a matter of minutes. There are several tools available in the market to monitor the volume increase in a particular crypto which helps in identifying such schemes. I know some people make money like this but I am not one of them and I would suggest you stay away from it too. The most sophisticated form of scam. In this type of crypto scam, scammers make fake Twitter and Facebook account to impersonate the actual legit project or the person behind it. You will find many impersonators on Twitter acting like Vatalik Buterin or Binance’s CEO and announcing airdrops etc which are never true. Also, scammers have started acting as crypto exchange support staff to scam people of their crypto funds. Here are the reports. Scams in any industry is not a new thing and crypto being a decentralized and open source concept is one of the easiest to replicate. The only way to not get scammed is to trust legit sources of information, as well as self-education of investors through trusted sources like CoinSutra. CoinSutra has all the material to make you understand how the whole crypto ecosystem works that’s why all you need to do is to spend some time teaching yourself so that you don’t get scammed. When do you think the Eos team will actually deposit airdropped tokens into the Exodus wallets? Hi, thank you very much for always delivering precious information on cryptocurrencies. I am on the point to invest in westlandstorage.com, what do you think of it? I was cruelly scammed by CryptoMT4 in November 2017. I was doing well while I was investing but after accumulating more than 4500 euros I wanted to withdraw 2000, it took me a while to communicate back to Philippe Ballesio who acted as account managers, the fraudster dishonestly gained my trust and I cheated, and after torturing myself with presenting documents that supported my identity, they finally confirmed that everything was fine and that the next morning they would deposit the 2000 euros in my account. But what was my surprise that the next morning they sent my account almost to zero, making a supposed investment at a loss from 10 at night to 6 in the morning, they took all my money without being able to avoid it. I could not even communicate with them after that and no one was responsible. I only know that today I do not even have access to the platform and I am paying an important debt for my good faith. Please beware of this kind of scammers like Philippe Ballesio. A great article. It is unfortunate and unavoidable that people will always find ways of taking criminal advantage of great new technologies. On the flip side, it does indicate that people are willing to adopt cryptocurrencies and shows how widely accepted the technology has become. True, I agree that’s why teaching our peers about it is very important for a positive adoption. Sad to know that. Thanks for adding value to the community despite your loss.